Oranienstein Castle is one of the historical landmarks that can be found in the the small and beautiful German town of Diez. Oranienstein and the other castle in the town, where were the seats of the Dutch Earl, gives the historical aspect of town and its relationship with the Dutch over the centuries. The castle dominates the town and has a splendid view over Diez. It is a genuine work of baroque art and architecture, erected in the 17th century. Today the castle serves as headquarters of the German army. The small chapel belonging to the mansion is one of the favorite places for weddings in Diez. Especially popular is the concert hall of the palace Oraniensteiner Konzerte, which regularly have guest classical music artists from around the world. 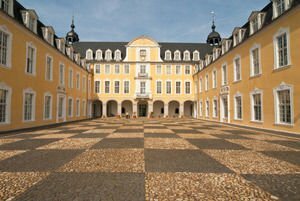 The beautiful baroque castle was built between 1672 and 1684 by the order of Albertina Agnes, who was Princess of Nassau-Diez. Before the castle was built there was Dierstein, on whose ruins Oranienstein was built. The castle was virtually leveled during the Thirty Years War and was onceused as the residence of the ancestors of Netherlands Queen. In 1696 began the transformation into baroque castle. The main contributor to this major restoration was the French architect Daniel Marot and also the Italians Eugenio Castelli and Antonio Woman. The three created the beautiful plaster the internal wall and ceiling that and were painted by famous Flemish master Jan van Dyk. In 1811 came bad times to the castle, because Prince William VI refused to join the so-called league of Napoleon on the Rhine. As a result, the prince lost the castle and Napoleon sold all the furniture and paintings. The castle then became the summer residence and hunting lodge of the Grand Duke of Luxembourg. After 1929 the Oranienstein Castle was renovated and opened as a museum and in 1962 the castle served the German army.